Aston Shaw, a local accountancy firm, has been busy fundraising and raising awareness for the local children’s charity EACH (East Anglia’s Children’s Hospices) since it first launched the campaign in February of this year. 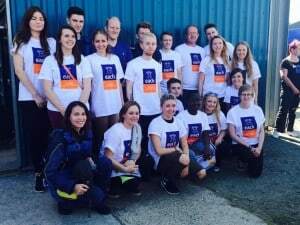 The main event – a group tandem skydive with 25 staff members – has been hugely successful, raising over £10,000 for the local charity. The day itself was a nerve-racking experience for some, followed by feelings of relief and an overwhelming sense of pride. One of the brave skydivers commented: “I was really anxious and apprehensive on the day, but afterwards I couldn’t have been happier – it was an incredible experience and I’m tempted to do another!”, these feelings were echoed amongst most of the staff who took part at Aston Shaw. The skydive took place at Beccles Airfield, on August 22nd, the weather was perfect and the day ran as smoothly as possible. All the staff are pleased to have surpassed the initial target set by the firm. Post-skydive donations continue to roll in, and the total continues to rise. EACH supports families and cares for children and young people with life-threatening conditions across Cambridgeshire, Essex, Norfolk and Suffolk and relies heavily on donations from fundraising activities. The £10,000 raised by Aston Shaw will largely go towards the nook appeal; EACH is raising money for a new, bespoke hospice to be built in the heart of Norfolk. The new hospice will be much better equipped to provide the services that the children need, and will bring new facilities for the children to enjoy.